Although it isn’t yet being called a drought, conditions in Nebraska are unusually dry and warm this winter. 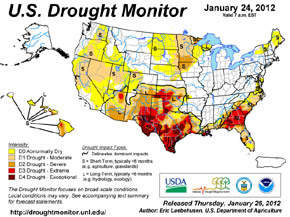 The U.S. Drought Monitor lists much of the eastern two-thirds of Nebraska as “abnormally dry” through Jan. 24, 2012. In the Boone County area, snowfall amounts have been unusually light in December and January, and less than two-tenths of an inch of precipitation has been recorded in the two-month period. Temperatures have also been unusually warm, and record highs of 70 degrees or more were recorded in several Nebraska communities on Monday, Jan. 30. At the Albion Airport, the official high temperature on Jan. 30 was 69 degrees.